MyTop have simplified Jeep Life by creating a button activated convertible that can pop up or down in just 8 seconds. It is fully lined for better sound, heating and cooling. 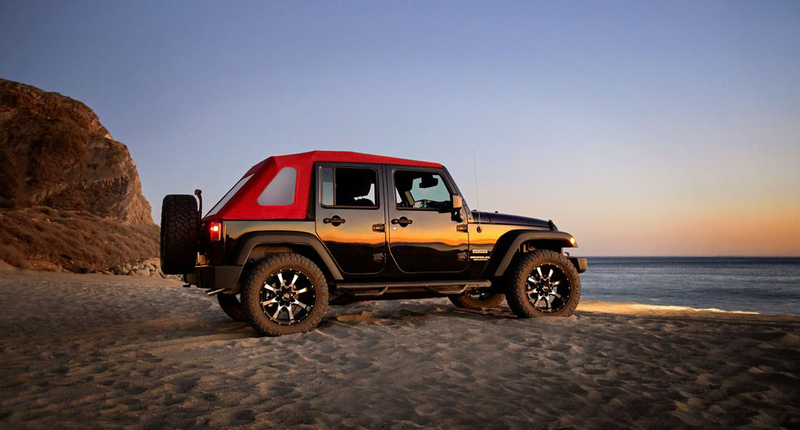 Available in an array of colours to match your Wrangler, or mix it up! 1.The MyTop Convertible Roof Top for all model wranglers is a recreational soft top with electronic conversion ability. As a recreational device it is accepted that in some adverse weather conditions (rain/wind) the top may not be completely weather tight. 2. I/We will take all reasonable measures to ensure duty and care to the Vehicle. Including but not limited to, parking inside or under cover where possible, maintaining appropriate insurance for the Vehicle and any personal belongings, ensuring all measures are taken when re instigating the roof into the closed position and keeping any personal belongings stored carefully. 3. That we have been advised by Winger to seek the advice of an expert independent of Winger Hamilton Limited prior to purchasing the Vehicle as to the weather tightness of the Vehicle. 4. Not withstanding the advice of Winger to obtain independent expert advice, I/we record that I/we do not wish to obtain such independent expert advice. Have obtained independent expert advice and are entirely satisfied with the advice. 5. We release Winger from all claims of whatever nature arising from any weather related issues including, but not limited, to water tightness, operational error causing any damage to either the Vehicle, the MyTop Wrangler Convertible Roof Top or any personal belongings.